NOTE: If the Samsung Gear 360 is not charging properly, take the Samsung Gear 360 and the charger to a Samsung Service Center. 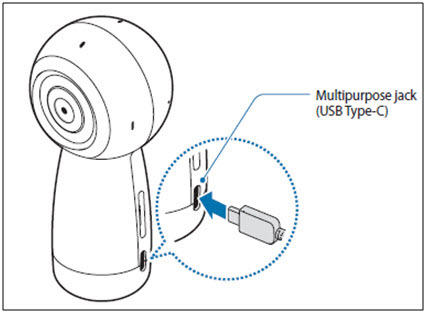 1.Plug the small end of the charger into the multipurpose jack of the Gear 360, and plug the large end of the charger into an electric socket. 2. After fully charging, disconnect the Gear 360 from the charger. First unplug the charger from the Gear 360, and then unplug it from the electric socket.